Graham Regional Theatre, about 2 hours west of Dallas, Texas, moved into a new space and asked me to make them a sign that would fit their spot on the town's historic square. 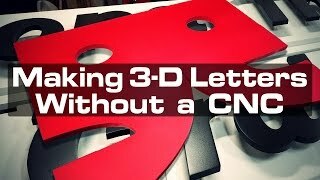 Measuring nearly 20 feet long, the finished piece features floating, dimensional letters made from expanded PVC sheet and cut without the help of a CNC router. It had to be transported in three pieces, then assembled and lifted into place while standing on ladders atop an awning 12 feet above the street. Thanks to Christian Sanders, Kay Berru and "Mutt" Wenninger for their help with the installation. See www.grahamregionaltheatre.com for show schedules. Thanks also to Steve Ramsey, whose tip on removing spray-glued templates with a heat gun saved me hours of picking torn bits of paper off my letters.